Nikolas is a highly spirited, passionate, adventurous, bright and happy kid who puts ﻿100% into all things physical. He discovered his love for running when he began to run with his dad - his greatest inspiration! Nikolas ran his first 5k when he was only five years old, mostly on his dad's shoulders. 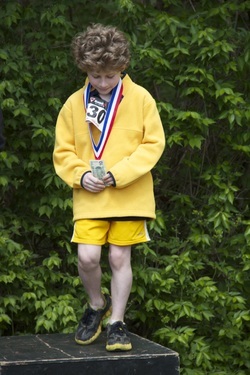 At age six, he ran his first race solely on his own two feet and hasn't stopped running since. Enjoying both road and trail running, Nikolas often strays off the beaten path when he's training — literally! He can’t run in a straight line, even when there is some form of pathway. If you’re behind him, you can watch him kicking rocks and grass, jumping in the occasional stream, and in winter, climbing up the largest snow mound. His favorite running weather? The extremes; snow or sleet, rain or over one hundred degrees, of course! According to Nikolas, the worse the weather, the more fun the workout. Why would you run when it’s nice outside, he wonders ... that’s more of a time for playing baseball, football, golf, or street hockey (he loves these sports too!). He can’t wait for his chance to run in hail but his mother has informed him that he’ll be wearing a helmet when the time comes! Nikolas decided to take something he loves to do and help others with it! So, at age nine, he launched his very own philanthropic campaign called “Running the World for Children,” to raise money to help kids in need. He ran a marathon on each continent around the world and, on September 6, 2014, he became the youngest person to complete a marathon on each of the seven continents! His Seven Continent Journey raised more than $42,000 for a non-profit organization called Operation Warm, whose mission is to provide new winter coats to children living in need — so that every child wearing a new winter coat feels warm, valued and able to attend school on even the coldest of winter days, healthy, full of pride, and ready to learn! Thanks to Nikolas's efforts, over 2,100 children have brand new winter coats! Operation Warm is a non-profit started by Nikolas’s grandfather. Nikolas has grown up realizing the importance of helping people less fortunate. His next endeavor is Running the World for Children: Stateside campaign! Nikolas is running a marathon in each state of the U.S. to help children in need receive critical eye-care by raising money for the non-profit called the Seva Foundation. Since 1978, Seva has been dedicated to the prevention of blindness and preservation of eyesight. Seva’s eye care programs make a special effort to reach children, the most vulnerable members of our human community. Nikolas's fundraising efforts will be specifically for children. Donate Here! Nikolas's always says, "do what you love for good" and, "you don't have to be big to make a difference!"